ADA price corrected lower and found support near the $0.0400 level against the US Dollar. There is a major bullish trend line formed with support at $0.0415 on the 4-hours chart (data feed via Kraken). The price is trading with a positive bias and it may continue to grind towards $0.0480 or $0.0500. Cardano price is placed nicely in an uptrend against the US Dollar and Bitcoin. ADA could gain bullish momentum towards $0.0500 if there is a clear break above $0.0465. After a massive rally above the $0.0550 level, cardano price started a downside correction against the US Dollar. The ADA/USD pair declined below the $0.0500 and $0.0465 support levels to trim most its gains. It even traded below the $0.0420 support before buyers emerged near the $0.0400 support. A swing low was formed near $0.0391 before the price started an upward move. Buyers gained strength recently and pushed the price above $0.0420. The price even traded above the 23.6% Fibonacci retracement level of the recent decline from the $0.0546 swing high to $0.0391 low. Currently, the 55 simple moving average (4-hours) is acting as a resistance near the $0.0450 level. The next key resistance is near the $0.0465 and $0.0466 levels. Besides, the 50% Fibonacci retracement level of the recent decline from the $0.0546 swing high to $0.0391 low is near $0.0469. Therefore, a proper break above the $0.0465 and $0.0469 levels may clear the path for more gains. The next stop for buyers could be $0.0500 or $0.0515. An intermediate resistance is $0.0487 and the 61.8% Fibonacci retracement level of the recent decline. On the flip side, if there is a downside correction, the $0.0435 and $0.0420 levels may act as support. 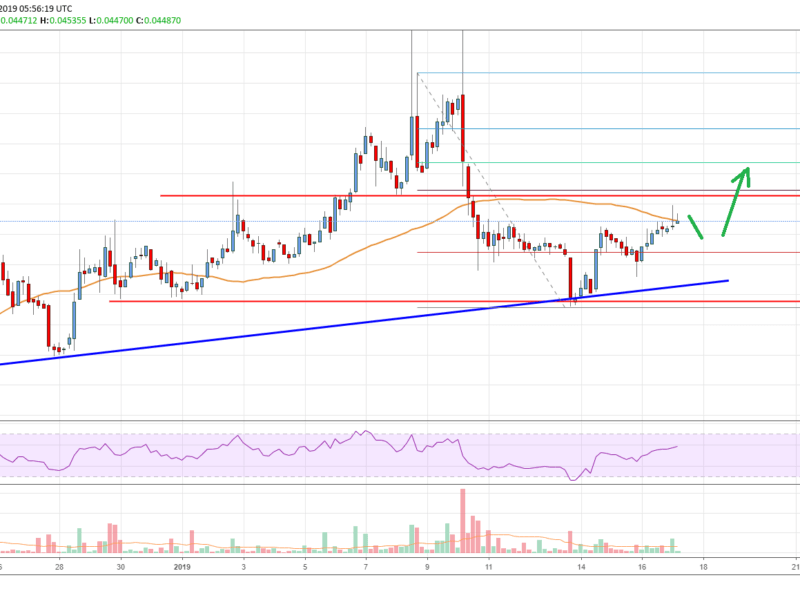 The chart indicates that ADA price remains well supported on the downside above $0.0400. There is also a major bullish trend line formed with support at $0.0415. Therefore, there are high chances of more gains above $0.0465 and $0.0480. 4-hours MACD – The MACD for ADA/USD is moving nicely in the bullish zone. 4-hours RSI – The RSI for ADA/USD is well above the 50 level, with a bullish angle.